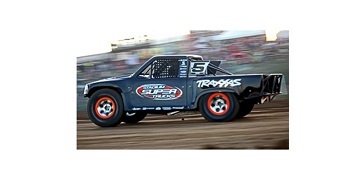 Traxxas®, the Fastest Name in Radio Control® has announced their commitment to a two-truck franchise for the inaugural 2013 season of Robby Gordon OFF-ROAD’s Stadium SUPER Trucks (SST), becoming the first official multi-truck team. Robby Gordon OFF-ROAD’s Stadium SUPER Trucks is a new breed of live off-road racing injecting new life into the stadium truck concept created by legendary racer Mickey Thompson. Robby Gordon’s new vision of Stadium racing pits specially engineered, 650 horsepower off-road trucks against each other side-by-side on grueling dirt tracks with a non-stop stream of huge jumps, crossovers, and tight corners. The 2013 season will be comprised of 12 heart-pounding, action-packed events in the greatest stadium venues across North America. Robby Gordon OFF-ROAD is a new breed of off-road featuring live motorsports, bringing back what was once the concept of legendary racer Mickey Thompson. Robby Gordon’s new concept of Stadium SUPER Trucks involves high-powered off-road trucks racing side-by-side on challenging dirt tracks consisting of huge jumps, crossovers and tight corners. Comprised of 12 heart-pounding races providing action in the greatest venues across North America. Professional drivers race for a huge Championship purse, the biggest in off-road today. Other classes involve BIGFOOT® Monster Trucks.